Community Giving Project - January 2019 Bonus! 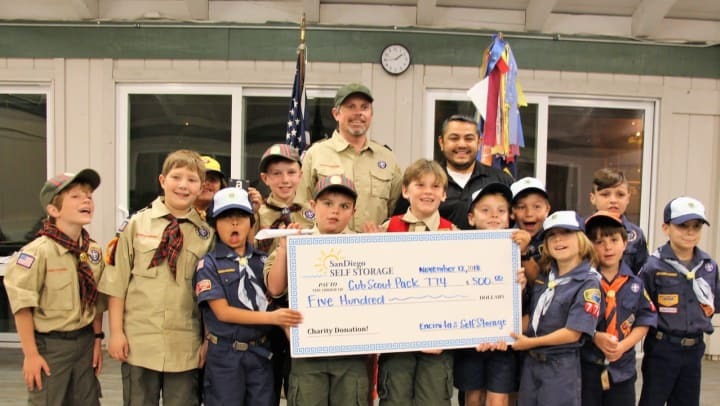 The team at Encinitas Self Storage wanted to provide their $500 donation to the local Cub Scout pack. Cub Scout Pack 774 has 15 scouts with 4 scout leaders. All of the leaders are parents of the scouts who volunteer their time. This contribution will help the pack fund enrichment activities that support the mission of preparing these young men to productively contribute to society. While Cub Scout Pack 774’s website is under construction, you can learn more about the Boy Scouts of America via their website.